﻿ Taipei City Goverment-City News-When T Fashion Meets Milan – Introducing Taipei’s Fashion Forces! When T Fashion Meets Milan – Introducing Taipei’s Fashion Forces! In 2018, the Department of Economic Development (DOED) created “T Fashion”, an experimental fashion base, on the 4th floor of Yongle Market. As an experimental project, a total of 16 fashion related schools, including Shih Chien University and Fu Jen Catholic University, were brought in along with 23 Fashion Art Taipei designers and renowned fashion designers to create an industry exchange platform, where new media and other fashion-related industries were also stationed. The facility is a work-sharing and exhibition space that is simultaneously streamlined with the textile and accessory-related industries found on the second and third floors of Yongle Market. The goal is to promote integrated industry chain development and stimulate overall industry development. The recipient of the 2014 and 2015 Fashion Art Taipei Gold Award, designer Chou Yu-ying, along with in-house fashion designers Daniel Wong, Chen Chun-liang, and Hsu Ming-mei were even chosen to participate in “braIN TAIWAN” curated by Tainan City Government and later made appearance at Milan Fashion Week, bringing Taiwan’s textile and fashion industries to the international scene. According to the Taipei City Office of Commerce (TCOOC), the city government has been devoted to promoting the fashion industry; over the past 7 years, the establishment of the Fashion Art Taipei series has been assisting hardworking designers who are hoping to actualize their dreams, and has also discovered many of Taiwan’s fashion designing talents along the way. Those involved have also been working tirelessly with the private sector to cooperate on an industry exchange platform that will provide guidance for many of the fashion world’s future stars to enter the global stage. For instance, designers Chou Yu-ying, Chang Shuo-yu, and Wang Li-ling have all debuted at international fashion weeks, and their collections have all received acclaim. The exchange platform has become an important channel for designers to jump start their career, as it vows to make Taiwanese designers shine and thereby stimulate all related businesses. 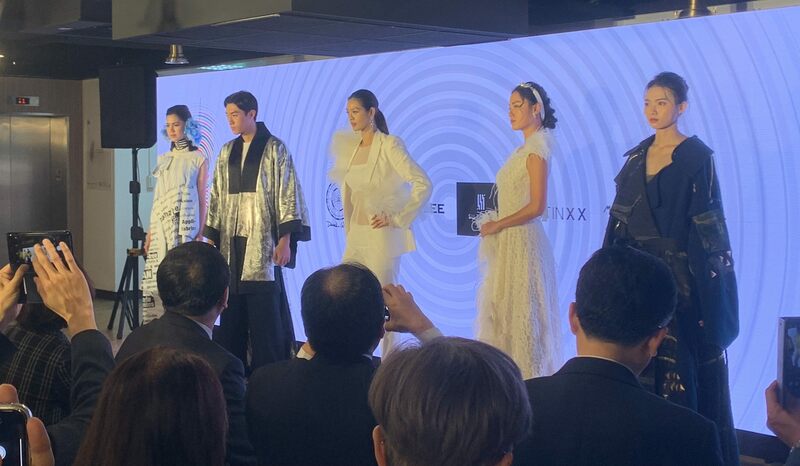 Last year, the Taipei City Government even launched an experimental fashion base for the first time – T Fashion, which was created to build an industry settlement that will focus on talent cultivation, brand incubation, and industry collaboration. Ultimately, T Fashion is expected to reinforce Taipei’s fashion related industry chains and therefore invigorate the city’s overall fashion industry development. The city government is hoping that through instituting exhibition and exchange platforms for the designers and bringing fashion industry talent in to work with businesses, cross-industry partnership opportunities will be created to assist the city’s fashion industry in entering the international scene. In the future, the government also welcomes more cross-industry or cross-city exchanges and collaborations as we cooperate on experience sharing and devote ourselves in advancing Taiwan’s fashion industry. Let us join hands and push the designers to shine on the global stage and revitalize all fashion related industries! For more information, please visit T Fashion Facebook page “T Fashion, an experimental fashion base” (https://reurl.cc/o9gAM) or TCOOC’ Facebook page on “all the fun activities in Taipei” ( www.facebook.com/tcooc/ ).